This Fourth of July, NASA’s solar-powered Juno spacecraft will arrive at Jupiter after an almost five-year journey. 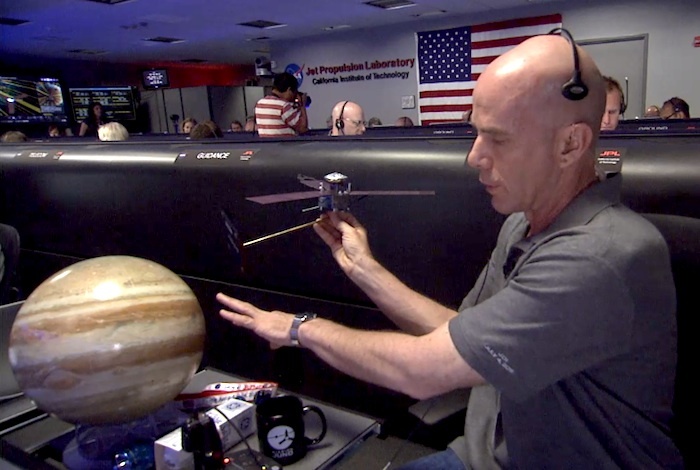 In the evening of July 4, Juno will perform a suspenseful orbit insertion maneuver, a 35-minute burn of its main engine, to slow the spacecraft by about 1,212 miles per hour (542 meters per second) so it can be captured into the gas giant’s orbit. 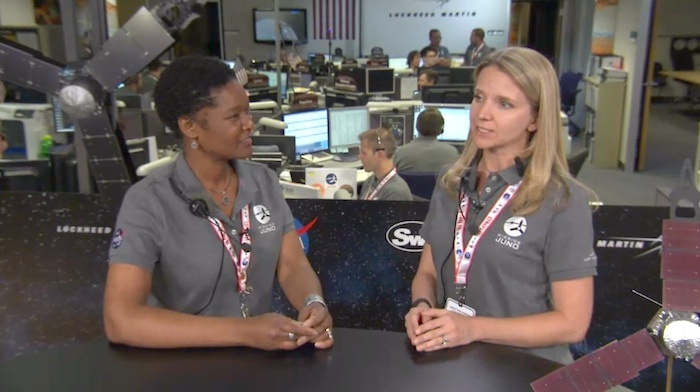 NASA TV coverage of orbital insertion begins on July 4 at 10:30 p.m. EDT. Once in Jupiter’s orbit, the spacecraft will circle the Jovian world 37 times during 20 months, skimming to within 3,100 miles (5,000 km) above the cloud tops. This is the first time a spacecraft will orbit the poles of Jupiter, providing new answers to ongoing mysteries about the planet’s core, composition and magnetic fields. 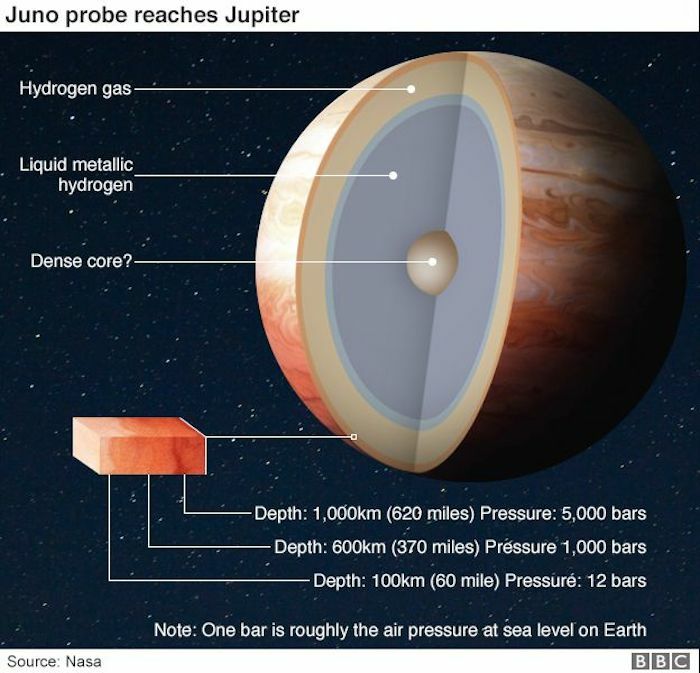 When the US space agency's latest probe to Jupiter tries to enter into orbit around the planet on Tuesday, it will be relying on a British rocket engine. 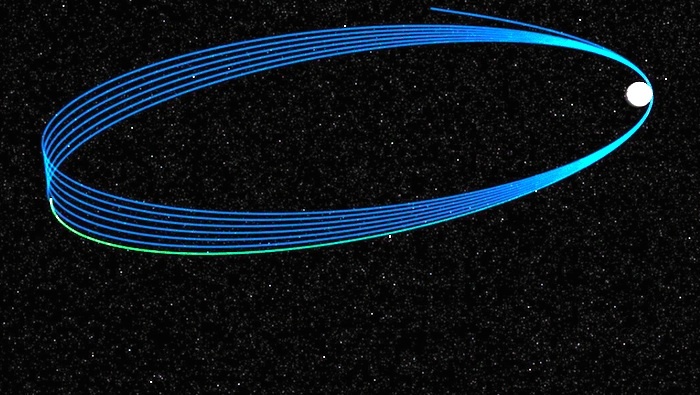 The Juno satellite is rapidly bearing down on the gas giant after a five-year journey from Earth. It must slow itself to get captured by the gravity of the giant world. This all-or-nothing job will be performed by its Leros-1b engine built by Moog-ISP in Westcott, Buckinghamshire. "It's a tremendous thing for us," said Moog's chief engineer, Dr Ian Coxhill. 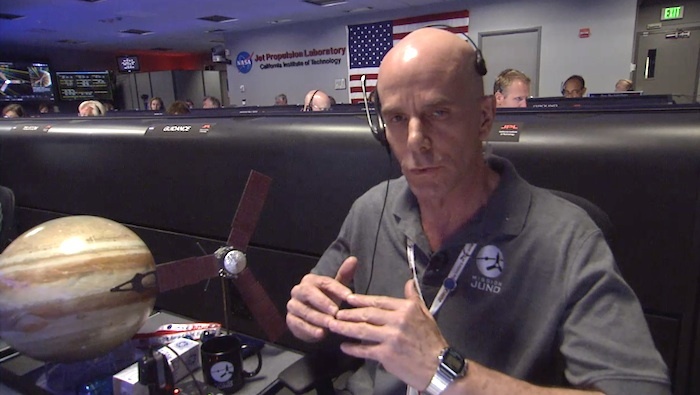 "The engine has to work for Juno to get into orbit; it has to burn at a precise time and burn for a continuous duration of at least 20 mins. "There'll be some frayed nerves, for sure." The Leros-1b was chosen to be the main engine on the Nasa satellite by its manufacturer, Lockheed Martin. 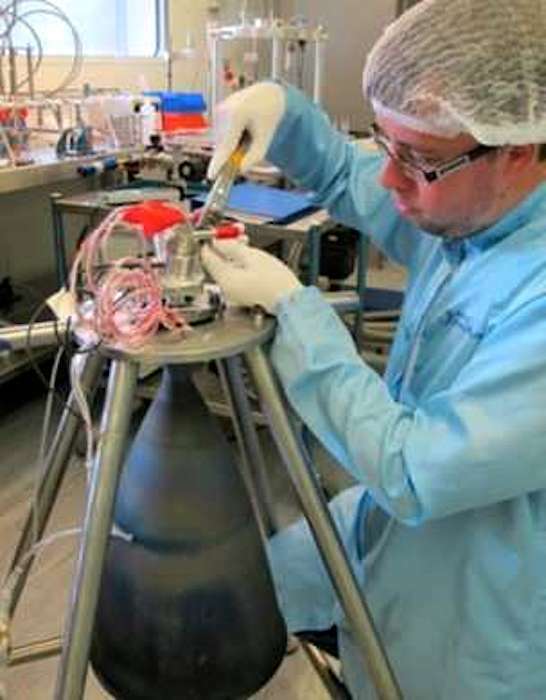 Previous American space agency missions have also used the Westcott technology, including the Messenger probe that went into orbit around Mercury in 2011. So, there is high confidence this latest engine will be up to the task. 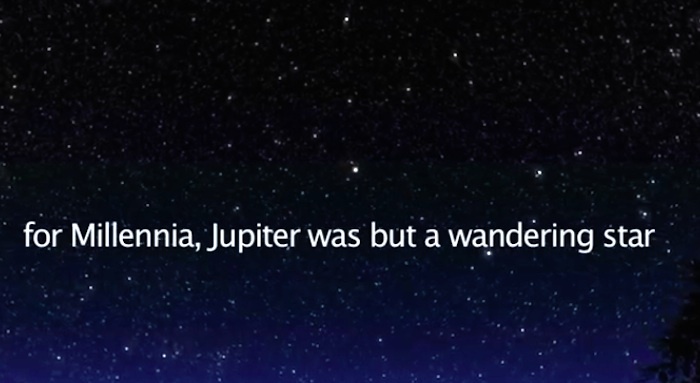 Indeed, Juno has already fired it during the epic journey to Jupiter. 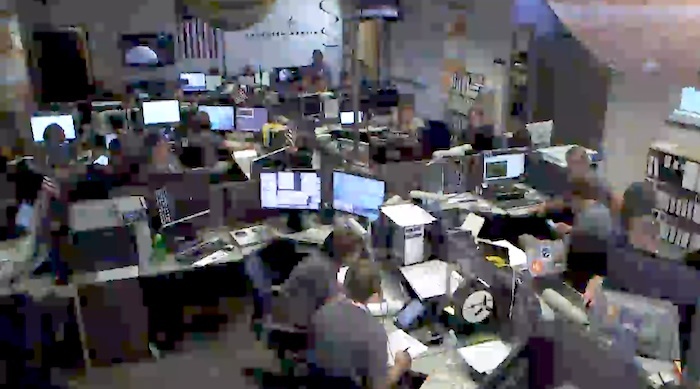 Back in 2012, the Leros had to operate reliably twice to refine the trajectory of the spacecraft, and on each occasion the engine burned flawlessly for more than 20 minutes. 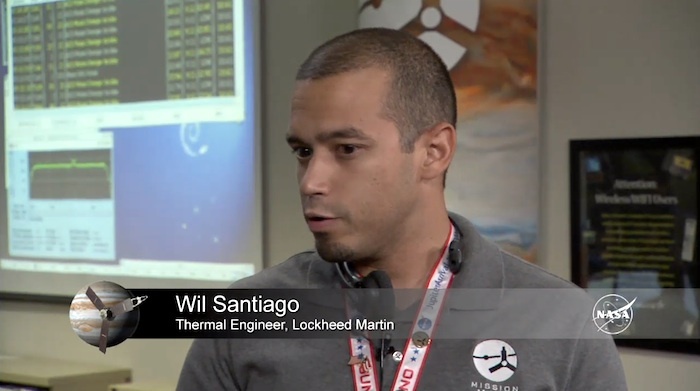 "In fact, things went so well that Lockheed Martin said initially they thought they had confused the real flight data on the engine burn with the simulation data. It was that accurate. So that's obviously really encouraging," Dr Coxhill told BBC News. The Jupiter Orbit Insertion manoeuvre will be conducted in the early hours of Tuesday morning, British time. Juno will turn and fire the Leros in the forward direction to try to remove about 500m/s from its velocity - enough so that it goes into a 53-day orbit around the gas giant. 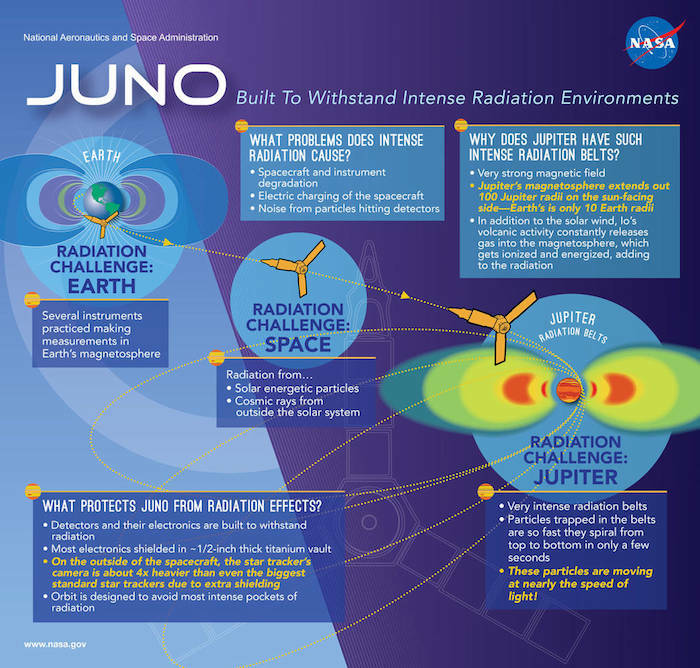 No burn or a burn of insufficient length would send Juno into the oblivion of deep space. 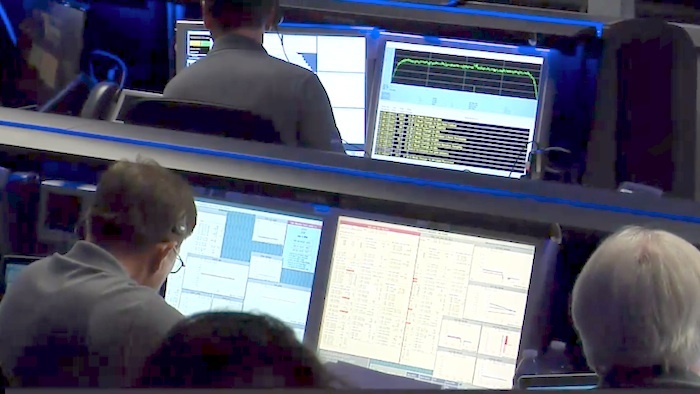 The probe will send back a series of tones to update Nasa and Lockheed Martin engineers on the progress of the insertion. The Leros should light at 04:18 BST (03:18 GMT) and terminate at 4:53 BST (03:53 GMT), for a full firing of 35 minutes in length. These are what are called Earth-receive times, when the confirmation tones are picked up by Nasa's antenna network. In reality, they will be listening 48 minutes in arrears because of the vast distance - 849 million km - the radio signals will have had to travel from Jupiter. And this means of course that the whole event is actually reported at Earth after it is all over. Juno will therefore have to rely on its automated systems to troubleshoot any problems that might arise during the firing. 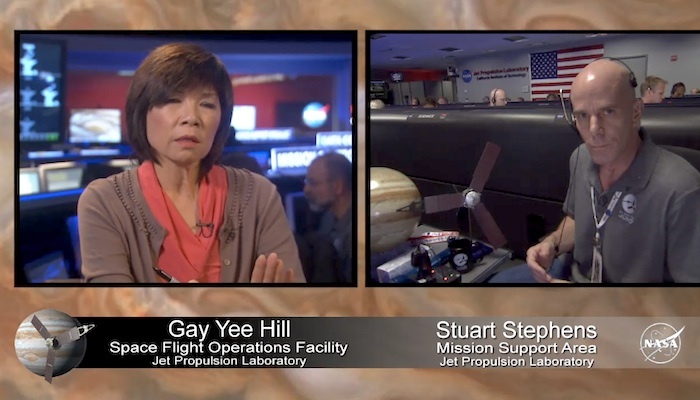 "The system is designed so that if, for instance, the radiation at Jupiter causes the computer to re-set and the engine to stop… it will do a quick recycle and restart the burn. 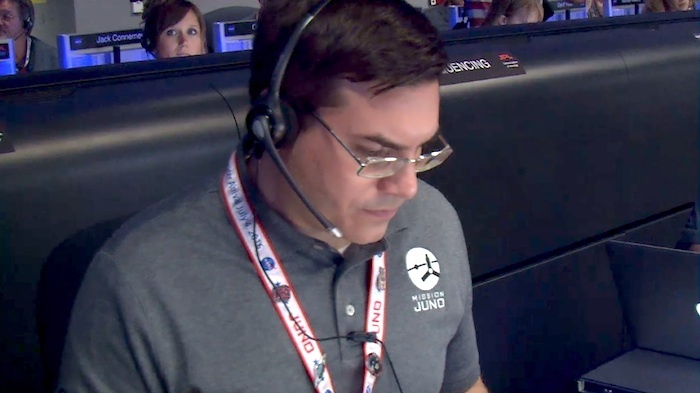 We expect to get all the way to 35 minutes," said Rick Nybakken, Nasa's project manager on Juno. 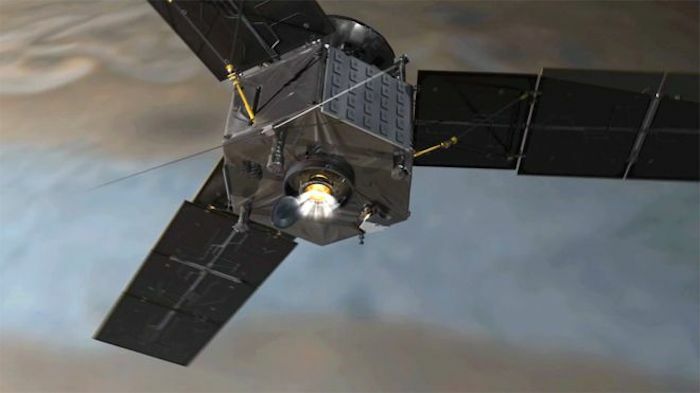 Another burn in October will tighten the initial orbit to one of two weeks from which the spacecraft can then conduct its science observations. 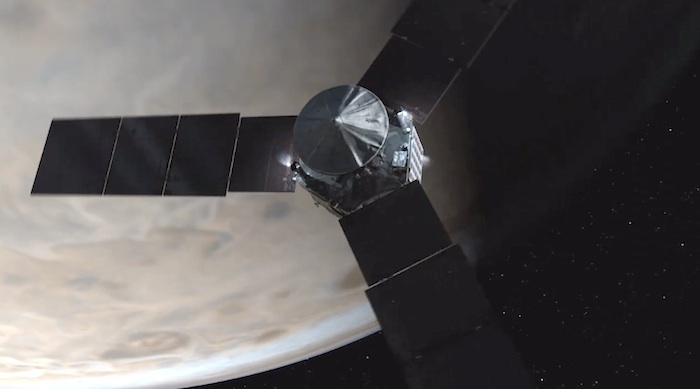 No probe has ever got as close to Jupiter as this mission will go. Its goal will be to look down on the colossal world to work out what it is made from and how it is put together. We should finally discover whether it has a solid core or if its gas merely compresses to an ever denser state the closer you get to the centre. We should also gain new insights on the famous Great Red Spot - the monster storm that has raged on Jupiter for hundreds of years. 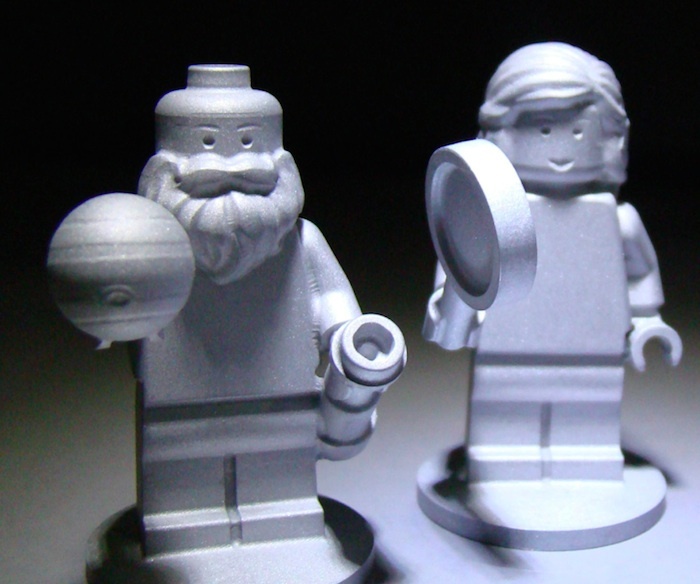 Juno will tell us how deep its roots go. But all this future knowledge depends on the 35 minutes of thrusting from the British engine. 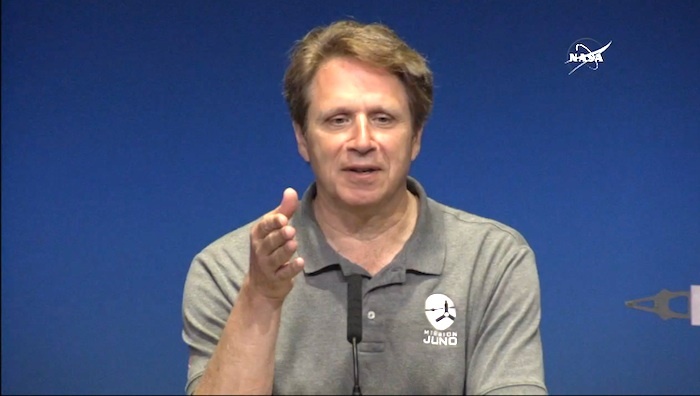 Principal investigator Scott Bolton will be following events here at Nasa's mission control, at the Jet Propulsion laboratory in Pasadena, California. 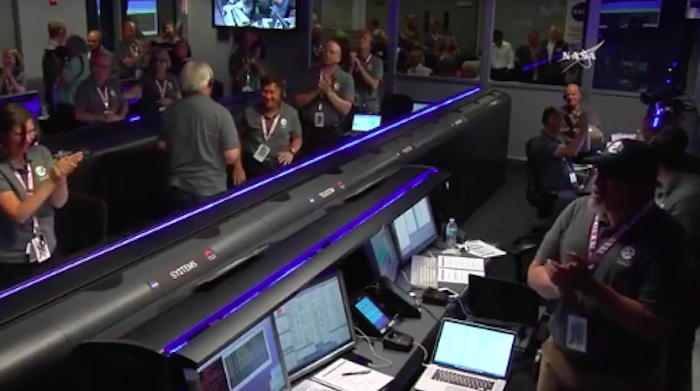 "We're excited to be finally getting to Jupiter but I have to temper that emotion with anxiety and the giant risk that we're facing because everything's got to go just right," he told BBC News. "It's a very complicated manoeuvre, the rocket has to fire at just the right time for the right amount of time and in the right direction for us to get into orbit. So, everything to do with this mission is riding on the activities of 4 July (California time)." There will be constant updates on Juno's orbit insertion across BBC News, and the BBC Sky At Night programme will run a special programme dedicated to the mission on Sunday 10 July at 20:30 BST, on BBC Four. UPDATE: NASA’s Juno mission has completed its main engine burn and entered orbit around Jupiter. 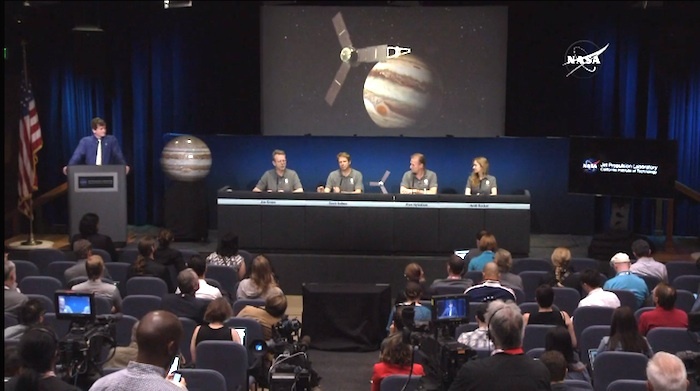 Watch the live NASA news briefing at 1 a.m. EDT for more information. NASA's Juno mission, launched nearly five years ago, will soon reach its final destination: the most massive planet in our solar system, Jupiter. On the evening of July 4, at roughly 9 p.m. PDT (12 a.m. EDT, July 5), the spacecraft will complete a burn of its main engine, placing it in orbit around the king of planets. 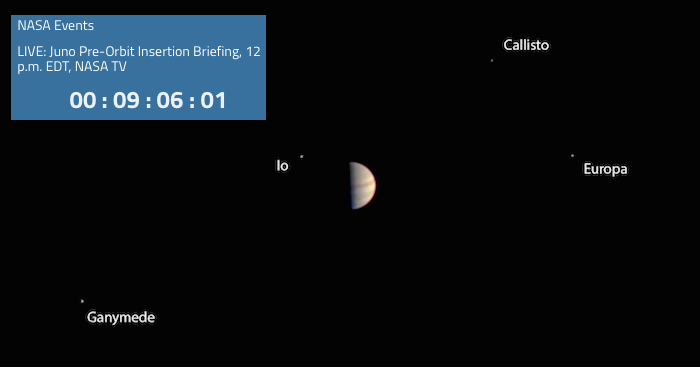 At 8:18 p.m. PDT (11:18 p.m. EDT), Juno's 35-minute main-engine burn will begin. This will slow it enough to be captured by the giant planet’s gravity. The burn will impart a mean change in velocity of 1,212 mph (542 meters a second) on the spacecraft. It is performed in view of Earth, allowing its progress to be monitored by the mission teams at NASA's Jet Propulsion Laboratory in Pasadena, California, and Lockheed Martin Space Systems in Denver, via signal reception by Deep Space Network antennas in Goldstone, California, and Canberra, Australia. 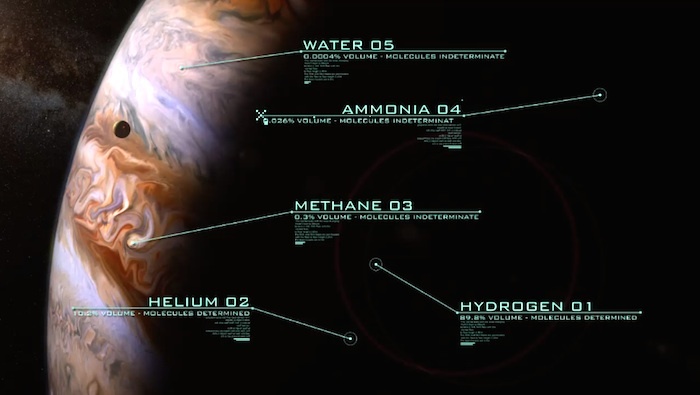 After the main engine burn, Juno will be in orbit around Jupiter. The spacecraft will spin down from 5 to 2 RPM, turn back toward the sun, and ultimately transmit telemetry via its high-gain antenna. 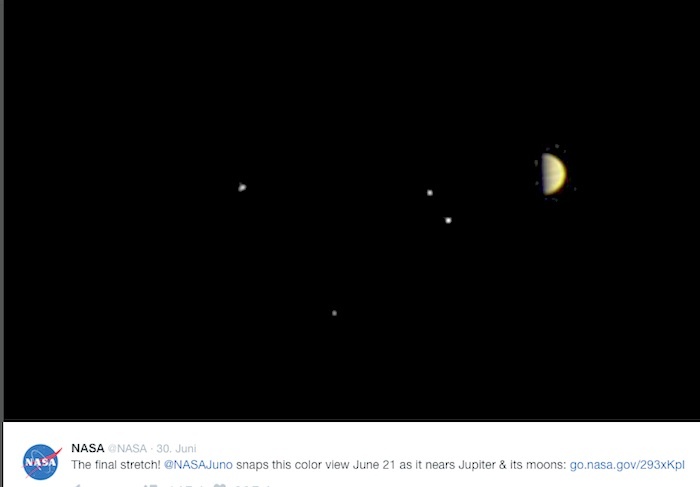 Juno starts its tour of Jupiter in a 53.5-day orbit. 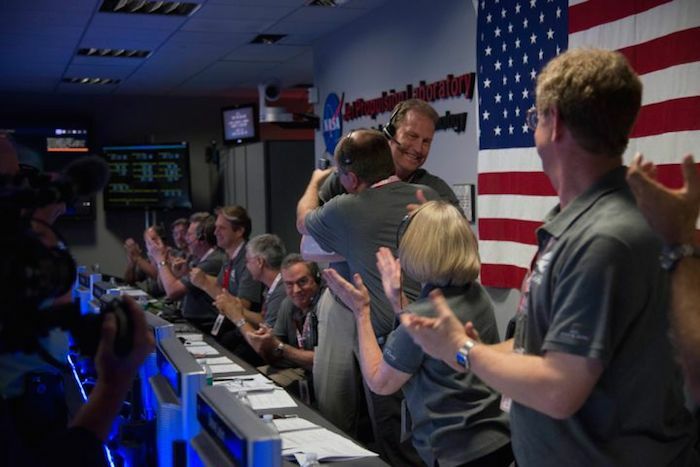 The spacecraft saves fuel by executing a burn that places it in a capture orbit with a 53.5-day orbit instead of going directly for the 14-day orbit that will occur during the mission's primary science collection period. 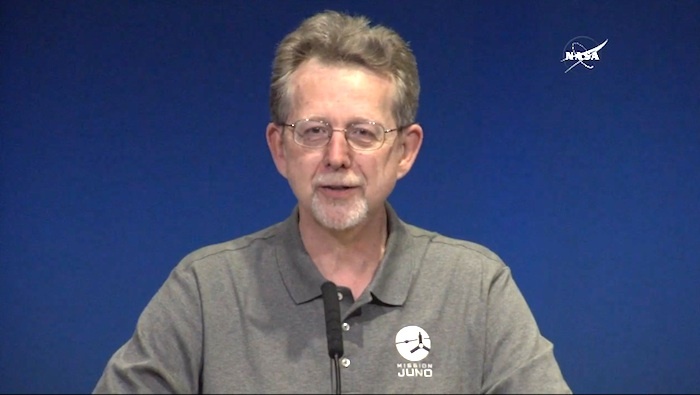 The 14-day science orbit phase will begin after the final burn of the mission for Juno’s main engine on October 19. 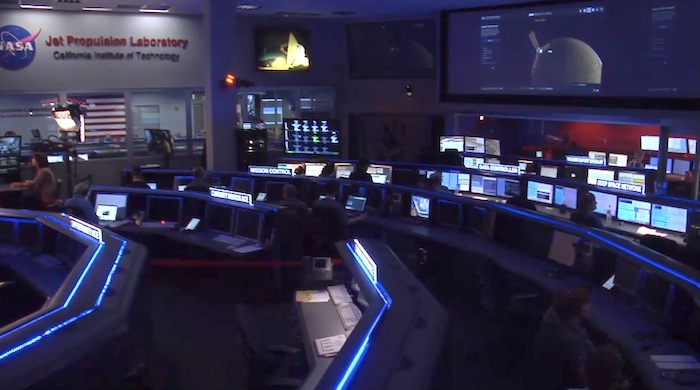 JPL manages the Juno mission for NASA. 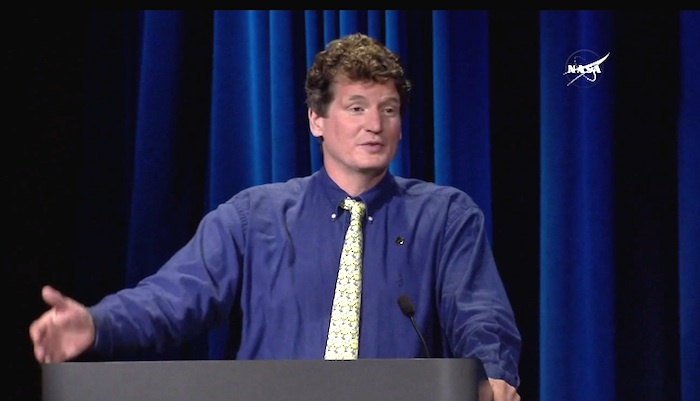 The mission's principal investigator is Scott Bolton of Southwest Research Institute in San Antonio. The mission is part of NASA's New Frontiers Program, managed at the agency's Marshall Space Flight Center in Huntsville, Alabama, for NASA's Science Mission Directorate. 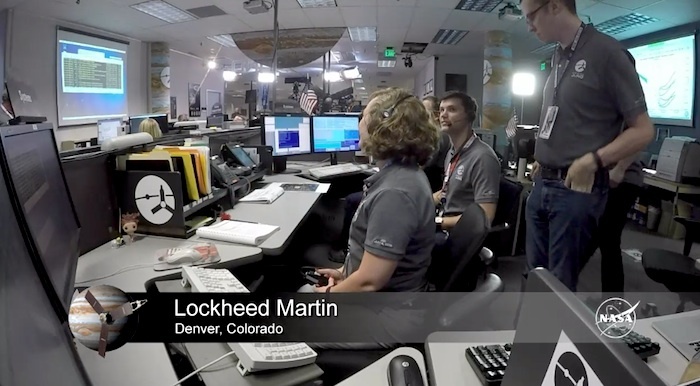 Lockheed Martin Space Systems in Denver built the spacecraft. 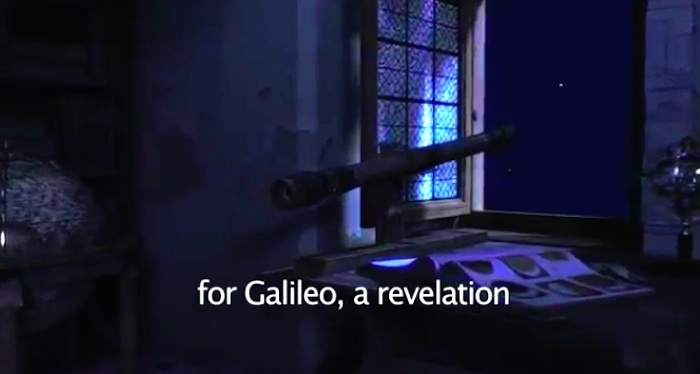 Io, Europa, Ganymede and Callisto — Jupiter’s four Galilean moons listed from the innermost to outermost — were discovered in 1610 through a homemade telescope by Italian astronomer Galileo Galilei. 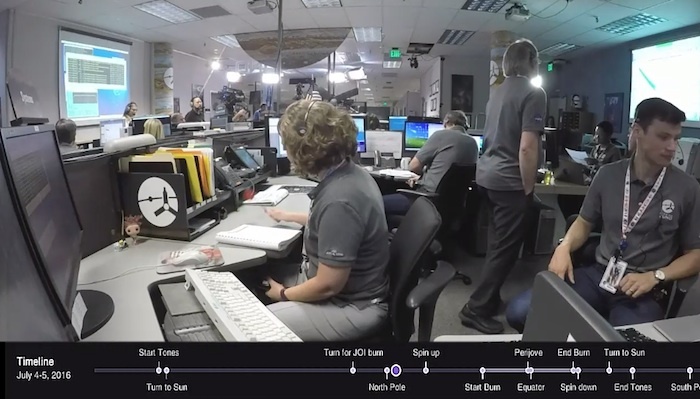 Scientists strung together images captured by the JunoCam instrument over 17 days to make the time-lapse movie released early Tuesday, just after Juno slipped into orbit around Jupiter, becoming the second mission to take up residence there. The volcanic moon Io is the closest of the four large moons to Jupiter, completing a lap around the planet once every 42 hours. Europa is next, harboring a liquid ocean underneath a frozen outer crust. It circles Jupiter every 85 hours, or three-and-a-half days. 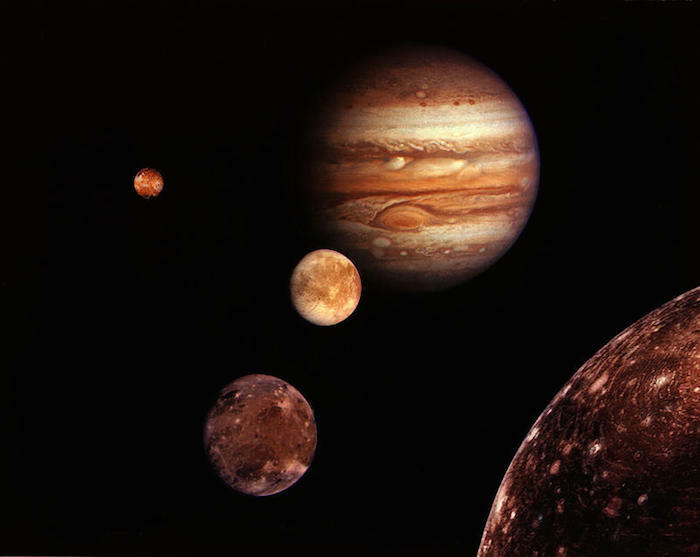 The largest moon in the solar system, Ganymede, is the third Galilean moon from Jupiter. The satellite is larger than Mercury, and orbits its host planet in seven days. The heavily-cratered moon Callisto circles Jupiter once every 17 days, the duration of Juno’s approach movie selected to show all of the Galilean moons completing at least one orbit. Juno’s arrival at Jupiter on Monday marked the beginning of a 20-month survey, focusing on the gas giant’s deep interior to search for a hypothesized solid core, study the source of its powerful magnetic field, and measure the dynamics of the atmosphere beneath Jupiter’s famous banded cloud tops. Completing a five-year journey, Juno’s approach over Jupiter’s north pole offered a unique view of the moon system. 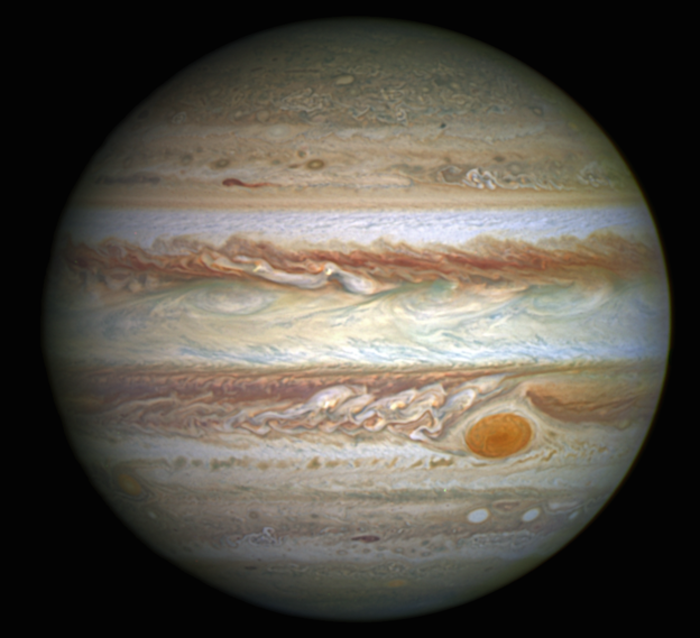 Previous Jupiter missions orbited or flew by the planet closer to the equator. 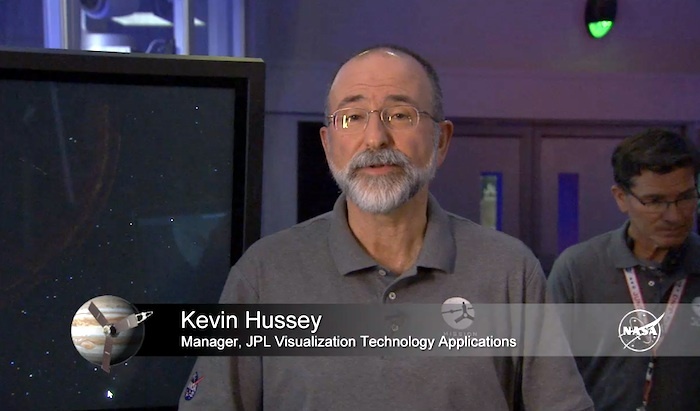 The engineers and scientists working on NASA’s Juno mission have been busying themselves, getting their newly arrived Jupiter orbiter ready for operations around the largest planetary inhabitant in the solar system. 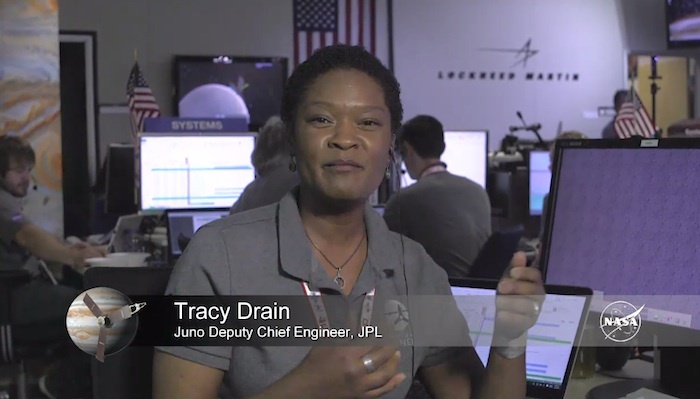 Juno successfully entered Jupiter's orbit during a 35-minute engine burn on Monday, July 4. Confirmation that the burn had completed was received on Earth at 8:53 pm. PDT (11:53 p.m. EDT) that evening. 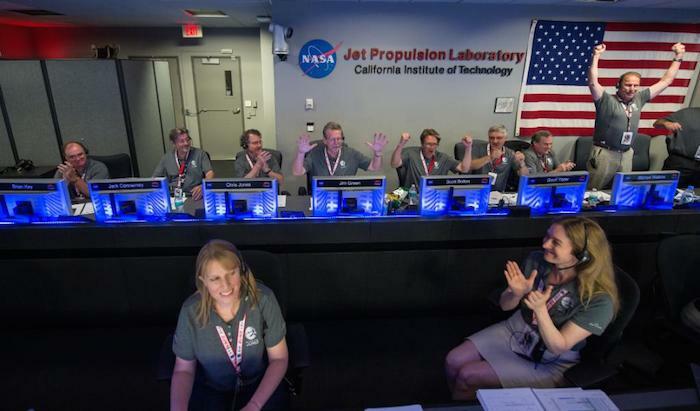 As planned, the spacecraft returned to high-rate communications on July 5 and powered up five of its science instruments on July 6. 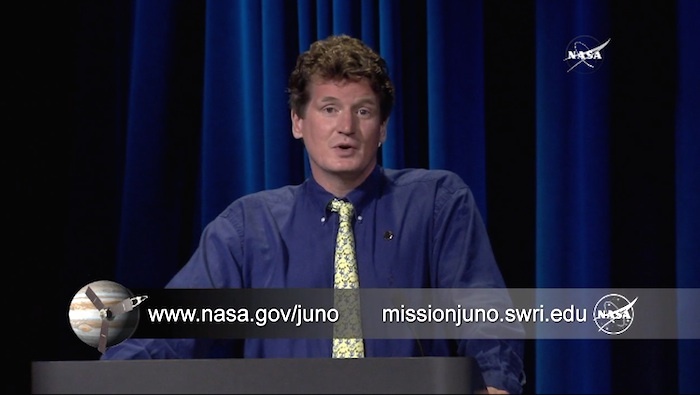 Per the mission plan, the remaining science instruments will be powered up before the end of the month. 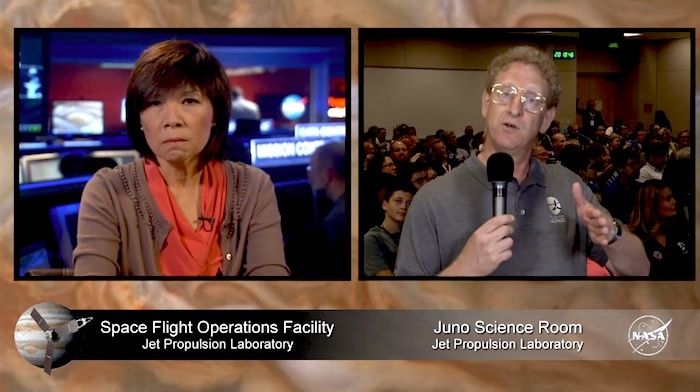 Juno’s science instruments had been turned off in the days leading up to Jupiter orbit insertion. The Juno team has scheduled a short trajectory correction maneuver on July 13 to refine the orbit around Jupiter. 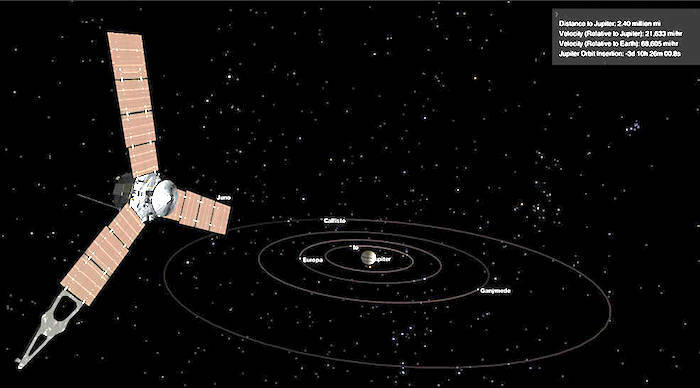 The next time Juno’s orbit carries it close by the planet will be on Aug. 27. 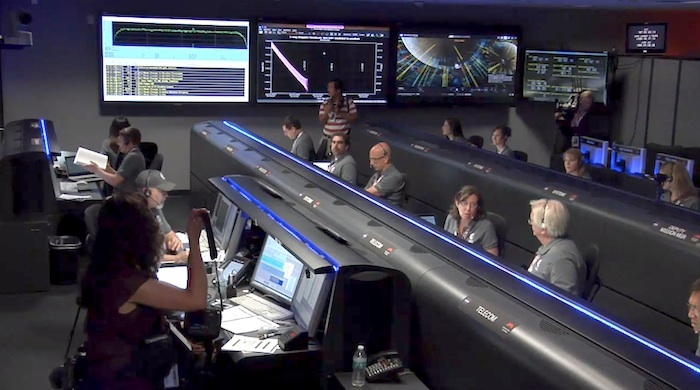 The flyby is expected to provide some preliminary science data.